still on the bike tip is this rad picture of cycling legend, eddy merckx. 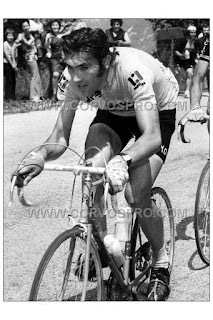 I've been a huge Merckx fan since i was a kid and would stick pics like this up all over my room. Merckx was nicknamed the "cannibal" as he would devour his competition, and also because he wanted to win everything; which he pretty much did. The dude not only won the tour de france 5 times, he also won all the jersey competitions in the tour and the giro d'talia in the same year + 35 stage wins in the tour; a feat that no one has even come close to matching, bonkers. while going for his 6th tour win some nutjob fan punched him in the kidneys, which was then followed by a crash in which eddy broke his cheekbone. most folks would have packed up and headed home, eddy? he finished 2nd, busted cheekbone an all. Plus look at those mutton chops he's runnin, total style. nomis X shoes = ?